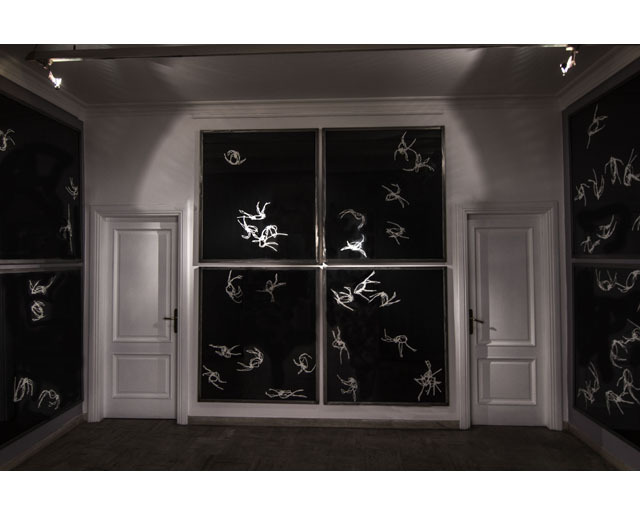 MAC Maja Arte Contemporanea is delighted to present French artist Pierre-Yves Le Duc's first solo exhibit in Rome. His artistic quest is mainly based on creating site-specific monumental installations consisting of cycles of complex and well-organized works with a strong focus on project. 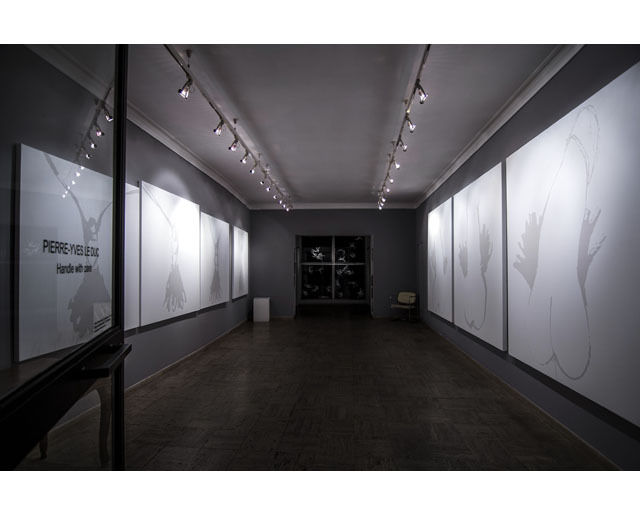 The oeuvre displayed here consists of twelve works selected from the GU series, four included in the Cosmic Whore series, and a set of three canvases titled Bandiera. 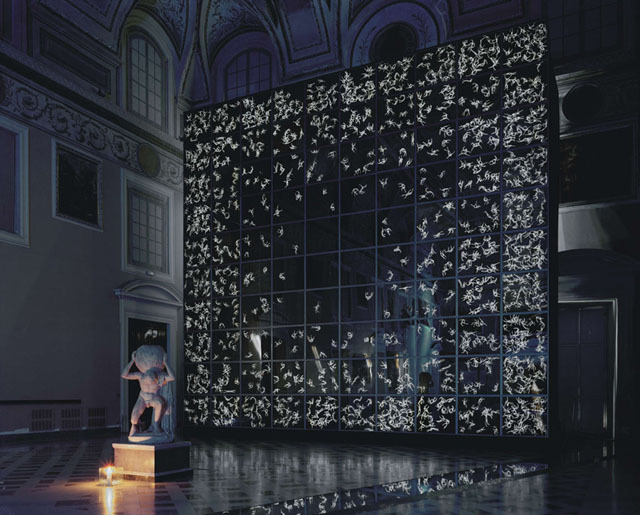 Exhibited at the National Archaeological Museum of Naples in 2004, the GU installation (acronym for 'Human Genome' as well as for 'Il Giudizio Universale' - 'The Last Judgement') is a monumental light box composed of one hundred drawings (ink on paper, 'technique de la réserve') in which anthropomorphic symbols become more and more numerous as the viewer moves away from the center. The pictorial signs - hominids of pure light - multiply themselves and cause black matter to disappear from the supporting frame. This continues until they become hypothetically as innumerable as to annul their individuality, allowing the initial and illusive white sheet to reappear. This centrifugal vision is opposed to a centripetal one: the entity depicted rarefies until every form of life becomes extinct once and for all, and black matter prevails. No specific reading interpretation is provided. Rather, this work is an enquiry into the vulnerability of human condition. The title Handle with care does not refer exclusively to man, whose survival depends so dramatically on issues that are not only environmental, demographic, political and social. In this exhibition Le Duc covers a second delicate topic - that of sexuality - and exposes seven paintings whose transfigured images open up to intentionally ambivalent multiple readings. The white canvases (acrylic on cotton canvas and linen veil) have been designed as being so pure as to suggest that anything close to them may corrupt them. Technically, they derive from a process of incessant elimination and rarefaction, and in this sense they are ambiguous because they refuse the artistic medium of painting by causing whatever is part of it to disappear. 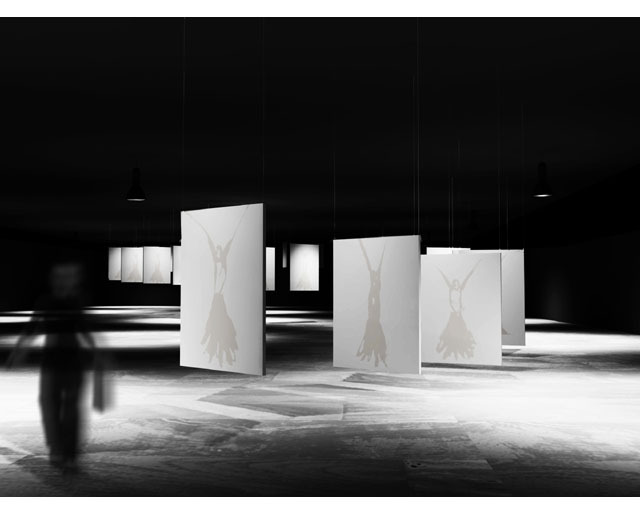 The theme is placed in a context of absolute purity and is alien to minimalism. More aptly, it is the child of an emotional directness which is void of frills, puritanical scribbles, and literary simpering – and which never, ever seeks easy provocations. Pierre-Yves Le Duc was born in France in 1964. In 1988 he graduated in Italian literature at the Sorbonne. During those years a period of wide-ranging training began during which his natural tendency for art was fuelled by a frequent attendance of theatres, contemporary dance shows, art galleries, museums and concerts. During his studies he took frequent trips to Italy until, having obtained a grant from university, he decided to move to Naples. He created his first works in 1989. A fundamental event was the 1992 meeting with Alfredo Bovio Di Giovanni. The partnership between the two artists bound them with a very strong friendship and mutual esteem. Le Duc attended Di Giovanni's Atelier until 1995, when Alfredo passed away. Le Duc owed to him the learning of the basic principles of the "craft" and the "academic" practice. Le Duc's artistic quest is mainly based on creating site-specific monumental installations consisting of cycles of complex and well-organised works with a strong focus on project. Among other things he has exhibited in Naples are the interactive public artwork 'Il Cenacolo' (The Last Supper) which he displayed around the obelisk of Piazza San Domenico Maggiore in 1994; 'Le nove muse e i nove poeti' (The nine muses and the nine poets), conceived for the semicircle of Piazza Plebiscito in 1995; 'I Quaranta Ladroni' (The forty thieves), displayed in the Naples Underground (Napoli Sotterranea) in 1996; 'Medium', exposed in the Sala of Lazzaretto in 1998; 'GU', exhibited at the National Archaeological Museum in 2004; 'Soap Opera', which portrays the cycle of water and life; and other works such as 'Erotoritratti', 'Osso-Buco', 'Bonificarsi, please !' and 'Rosarno, desperate house-lives'. He is currently developing 'Métastrophysique', 'Débordements', 'APPARATO', O (video installation), and 'Magigonie'. Other projects he is working on are the installation of the 'Motion Painting' monumental video and of the interactive 'Kosmic Whore'. In 2012 he moved to France with his wife and daughter, but keeps being creative at his Atelier in Naples. 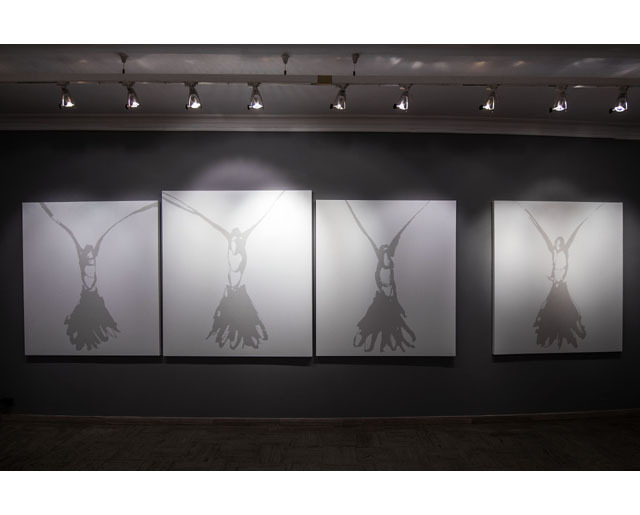 Le Duc has exhibited in Italy (Milan, Naples, Pavia, Salerno, Sorrento, Turin, and so on) and abroad (a one-man show of his work was held in Atlanta, United States in 2012). 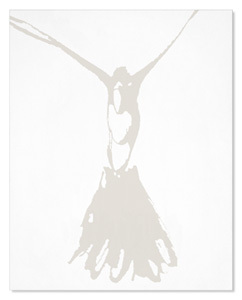 He has been present in important fairs such as the Art Basel fair, the Miami Art Fair and Artissima (Italy).